But what many do not know, is the complexity of this platform if used in smaller projects. To understand this you need to know, that Kubernetes was designed for the operation of large cloud environments as they are operated by Google, Amazon or Microsoft. This means that with the help of Kubernetes you can not only manage one server, but hundreds of servers with thousands of services. For most projects, this power is superfluous. But behind the scene we are still talking simply about Docker which is the core technology of containerized applications. And Docker in its core is just a command line interface (CLI) to manage a visualization feature of the Linux Kernel named Linux control groups (cgroups). Control groups allow processes to be organized into hierarchical groups whose usage of various types of resources can then be limited and monitored. This is what we all today know as the container technology. To build and operate more complex applications consisting of different services with the help of Docker we need to bundle several containers in one place. This is called a stack and can be described in a single file. Docker-Compose is the tool to managed these stacks. In the following example you can see a stack consisting of a MySQL Database and a WordPress application. This is pretty simple to use. Of course you can extend the compose file with a lot of additional information and configuration parameters. 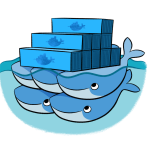 You can find more information about Docker-Compose on the docker homepage. The second question, which comes into the game with containers, is how you can manage applications distributed on different machines. Distribution is necessary to build more robust environments which will not depend on a single point of failure – like a disk error or hardware crash. All this features come out of the box if you have installed the docker engine. If you are interested in container-orchestration, you must not need to start with the often oversized technology offered by Kubernetes. This is mostly true if your project did not consists of dozens or hundreds of servers. The Docker Tools are a good alternative to Kubernets and easy to learn. Docker Tools are mostly sufficient and flexible enough for most projects – also in production. After all Docker-Compose and Docker-Swarm are easy to learn as these tools are part of the Docker core technology. To get a more detailed insight how to build a lightweight environment with Docker-Swarm, take a look at my Open Source project Imixs Cloud on GitHub.